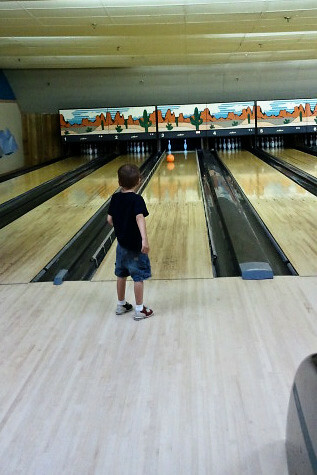 I took the kids bowling for the second time with their KidsBowlFree.com passes, and they had even more fun this time then last. Last time, Autumn fell then got upset so it really was only Nathan that enjoyed himself. This time Autumn was REALLY into it up to frame 6, then she lost interest. Which, is pretty good for a 2.5 year old! It was cute because I looked up and realized she was actually beating Nathan! I told Nathan and he was NOT happy, so he did everything he could to try to get as many pins down! Hee! Gotta love brother and sister rivalry. 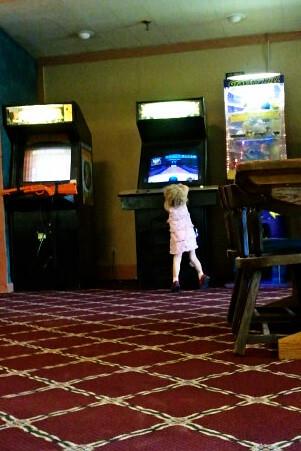 After Autumn got bored, she decided to check out the little arcade section. I must say, these bowling alleys look the same as they did when I was in them last (which was high school!). It is sort of sad how they are run down, I guess there isn’t a lot of money in bowling. But, the kids did have a lot of fun! Can’t wait to take them again next month.